The vast majority of Oconee County Republicans–84.7 percent–voted for Brian Kemp, contributing to his overall state victory with 69.5 percent of the vote. 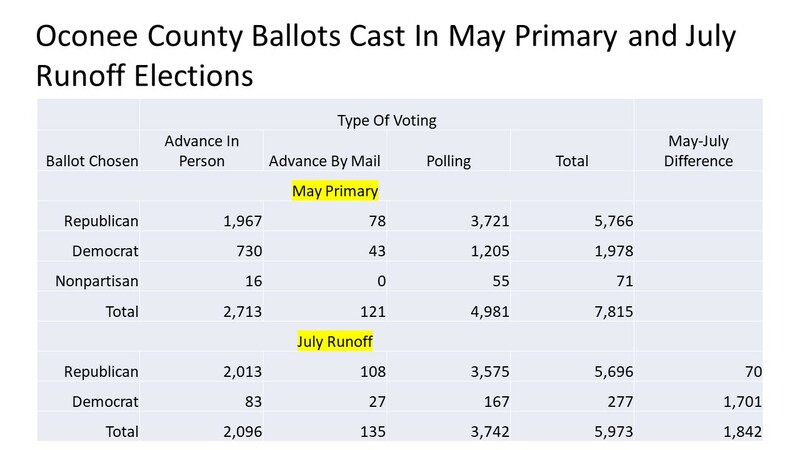 Republican turnout for early voting for the runoff actually was higher than during early voting for the May primary, even though fewer days of early voting were available. 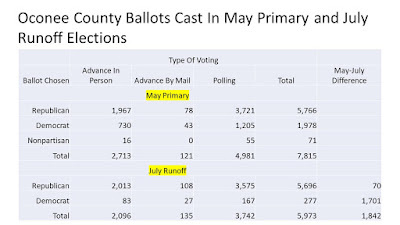 Thirty more Republican mail ballots were cast in the runoff than in the May primary. On election day itself, however, 146 fewer Republicans cast a ballot in the runoff than had been the case in the May primary. Voters could decide if they wanted a Republican, Democratic or nonpartisan ballot in May, but, for the runoff, those who had voted for a party in May could not switch parties. Fran Davis and Jennifer Stone, director and assistant director, respectively, of the Oconee County Office of Elections and Registration, said these choices were checked by the election officials, who had a record of the party chosen in the May primary. Democratic voting was much lower in the runoff whether Advance In Person, Advance By Mail, or on Election Day (Polling) than it had been for the primary. I was able to construct the table above with the assistance of Assistant Elections and Registration Director Stone. I was not able to obtain comparable data for the state. A total of 588,603 Georgians voted for either Kemp or L.S. “Casey” Cagle in the gubernatorial race on Tuesday. Slightly fewer voted in the race for lieutenant governor or secretary of state. In May, 619,711 persons voted in the Republican primary for the governor's race. A total of 158,496 voted in the Democratic primary runoff for state School Superintendent on Tuesday, the only race on the Democratic runoff ballot. This means at least 747,099 ballots were cast by the state’s 6,179,600 registered voters on Tuesday, for a turnout rate of 10.0 percent. In May, using the comparable calculation, the turnout rate was 19.3 percent. It isn’t possible with the data available publicly from the Secretary of State’s Office to determine the number of voters statewide who chose a nonpartisan ballot in May. Counting those votes would increase the turnout rate.